was born in Asheville, North Carolina, but grew up in Virginia," said Roberta Flack. "I began playing the organ at the age of four and started piano lessons when I was nine. Later on, it was a great honor for me to accompany the junior high chorus. Eventually I won a full scholarship to Howard University, where I earned my degree as a music major. I then taught music, math, and English in Farmville, North Carolina, and after that, I joined the Washington, D.C., school system. "During summer vacations, and even through winter, I worked part time at a fancy restaurant called the Tivoli. My job there was to accompany opera singers. It was my first public exposure as a performer, and I never even thought about singing." In the spring of 1967, though, Roberta decided to try making it as a vocalist. She soon was attracting such crowds at one nightclub that an extra room was added solely to showcase her talents. In the summer of 1968, she appeared at the Bohemian Gardens as part of a benefit for the Ghetto Children's Library. Jazz pianist Les McCann was in the audience, and he was so impressed that he arranged an audition for her with Atlantic Records. The result, in 1969, was a well-received debut album, First Take. "One of my friends in Washington was a folk entertainer named Donal Leace," Roberta continued, "and one day he turned me on to a record by the team of Joe and Eddie. It was 'The First Time Ever I Saw Your Face.' A British folk singer, Ewan McColl, wrote it in 1963 for his wife, Peggy Seeger, who was also a folk singer and the sister of Pete Seeger. I thought it was just beautiful and had to add it to my first album. "A lot of people ask me what I was thinking about while I was recording that song. Actually I was thinking about a little black cat that someone had given me, named Sancho Panza. I had just gotten back from being on the road for the first time, and I discovered that he had been killed. I only had one pet, and when I went into the studio, two days later, he was still on my mind. "After the album was released, a disc jockey in New Orleans started a one-man campaign to get the song pulled off the album as a single. Nobody at Atlantic, though, paid any attention to him. Then, three years later, Clint Eastwood called and said that he loved the song and wanted to use it in a movie. They were making this film based around the Monterey Jazz Festival, and they were using jazz and jazz musicians. The record label wanted to have it re-recorded with a faster tempo, but Clint said he wanted it exactly as it was. With the song as a theme song for his movie, it gained a lot of popularity and then took off." The picture was Play Misty For Me (1971), which turned out to be one of Eastwood's most popular movies ever. "First Time" was used in a steamy love scene between Eastwood and Donna Mills. Moviegoers inundated record shops for copies of what they'd heard. "When it was finally picked as a single," said Roberta, "obviously because of the Clint Eastwood thing, I was happy that the young man in New Orleans got credit as the one who broke the record." Atlantic, incidentally, did not release "First Time" exactly as it had appeared on the album. They believed, and rightly so, that it was an unusual track and, at nearly five and a half minutes, a little long for AM radio play. So they lopped off 66 seconds, making the time a more comfortable 4:15. 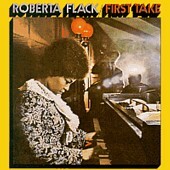 Roberta Flack went on to be named Top Female Vocalist of the Year both by Cashbox and at the Second Annual Soul and Blues Award Night in L.A. Record World called her the Top Jazz, Top Album, and Top Pop Artist of 1972. She won Billboard 's Trendsetter Award, for "moving jazz into the pop market with her soft, delicate style." At the Grammys, "The First Time Ever I Saw Your Face" was hailed as Record of the Year, while its composer, Ewan McColl, was cited for writing the Song of the Year. Not bad for a three-year-old recording of a ten-year-old song. Roberta had two more number-one hits in the seventies, "Killing Me Softly With His Song," which would also be named Record of the Year at the Grammys the next year, and "Feel Like Makin' Love". She then cut back on her performing to pursue outside interests, including educational programs for disadvantaged youth, but reemerged in late 1977 with "The Closer I Get to You," a number-two record in 1978. In 1980 she began a collaboration with Peabo Bryson, which culminated with a Top 20 single in 1983, "Tonight, I Celebrate My Love." Throughout the eighties Roberta performed many dates around the world with symphony orchestras and several shows with jazz legend Miles Davis. She contributed "Goodbye Sadness" to neighbor Yoko Ono's tribute album to her late husband John Lennon in 1984. "Oasis," a number-one R&B hit from the 1989 album of the same name, did not chart on pop, but she returned to the pop charts two years later with the Top 10 hit "Set the Night to Music," a duet with Maxi Priest.